This week I kept my card CAS (Clean and Simple). I chose the light pinks, woodgrain, and golds to create my card. I used the MFT stamp set "Flashy Florals" and a sentiment from "Beautiful Blooms". The brick wall embossing folder is from Stampin' Up! and all other dies are from MFT. I loved playing with this weeks The Card Concept inspiration pic. I hope you will play along too! 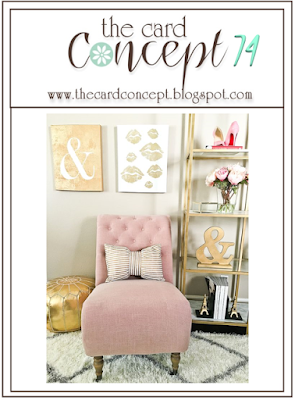 Be sure to visit The Card Concept Blog to see what my talented team mates created for this weeks challenge! Veronica, this is such a sweet card! Love the gold striped bow with the pink flowers as well as your embossed background!! What a blessing this card will be for the recipient!! Hugs and thanks for the inspiration, DT "Sis"! This is just as sweet as can be...love your wonderful card and that adorable gold striped bow, too darn cute. Oh that bow! Just perfect! Lovely, lovely card!!! Veronica, this is beautiful! I love the dimension of the bricks and the great color palette! SO pretty! So soft and pretty! A gorgeous take on the inspiration.